With summer finally here to stay, it’s time to make a chilled veggie soup. I’m a big fan of avocado and cucumber which make this one of my favourites. I found the idea for this recipe a few years ago out of a cooking magazine at my Dr’s office. I quickly glanced at the ingredients came home saw the avocado. Insert light bulb 😉 I whipped up a version of that soup. The original recipe called cilantro but I only had basil, I now use both. As well, the original used sour cream, I like greek yogurt, but you may use either one. A greek yogurt dip like I did below works too, and it saves the step of adding chili powder or tabasco. That extra zip is excellent in this soup, cut back if desired but don’t omit completely. Taste buds screamed, Yum! Avocado, cucumber, basil, you can’t mess up those ingredients! It’s light and refreshing on the palette and makes a wonderful lunch time meal with a sandwich on the side. I’ve served this in small appetizer sized cups with a warm crusty toasted baguette drizzled with olive oil.. Delish! 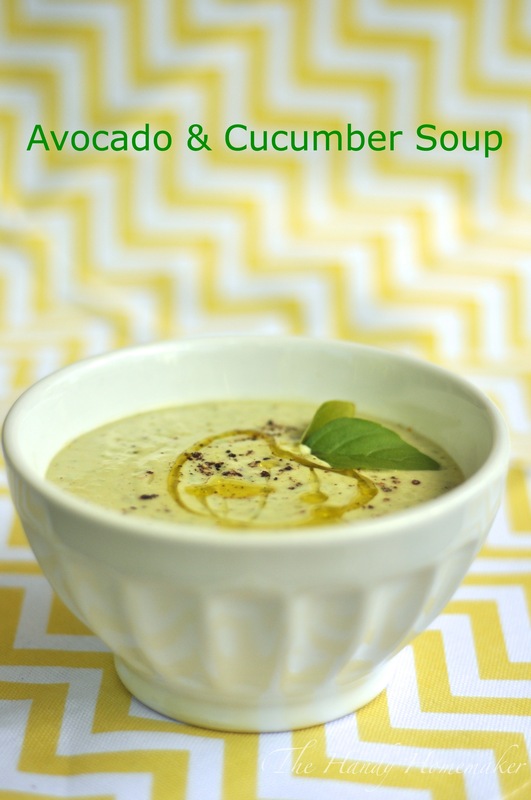 Avocado & Cucumber soup travels easily, which makes it great for picnics or to pack for lunches. Chill until ready to serve. The soup may thicken and you can thin down by adding a little more almond milk. Lunch today! Avocado & Cucumber soup with Garden Veggie wraps on the side.